Proton-gated urea channel viewed from outside the membrane. The channels are at the center of each of the six subunits, and the central hole is plugged by lipids (green). The acid in your stomach helps to digest food, but it also helps protect you from bacterial infection. However, one type of bacteria, Helicobacter pylori, is able to live in the acidic environment of the stomach. It is one of the most common bacterial infections, found worldwide in half of the population. It causes a continued inflammation of the stomach, which leads in some cases to stomach ulcers and stomach cancer. Surprisingly, when this bacterium is cultured, it can't tolerate acid conditions, unless it is also given urea at the same time. Helicobacter pylori uses urea, which is found in low levels in stomach fluid, to neutralize any acid that leaks into the cell. Two proteins cooperate in this process. First, a proton-gated urea channel, shown here from PDB entry 3ux4 , opens when the environment becomes acidic, allowing molecules of urea to enter the cell. Inside, the urea is broken down by urease (described below) into carbon dioxide and ammonium ions, which neutralize the acid. The proton-gated urea channel opens at pH below about 5.5-6.5. The channel is composed of six identical subunits, each with its own channel running through the center. 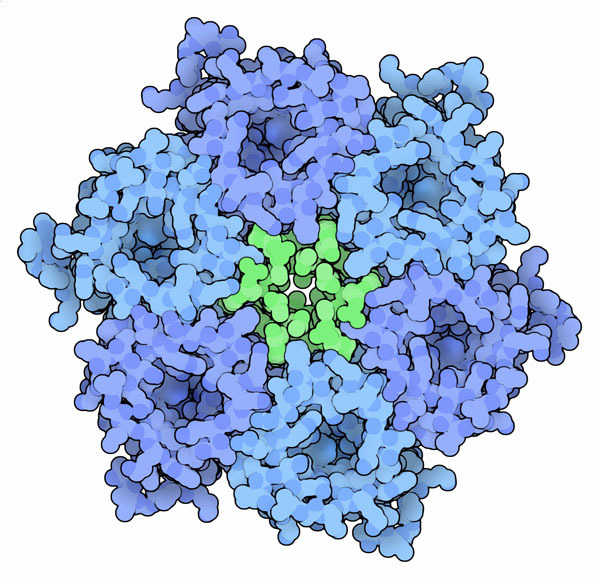 The crystallographic structure also captured a plug of lipids (shown here in green) that block the hole in the middle of the ring of six subunits, making sure that the channels are the only way through the membrane. The urease enzyme from Helicobacter pylori. Helicobacter pylori also makes a large amount of the enzyme urease, which can account for 10-15% of the total protein in the cell. 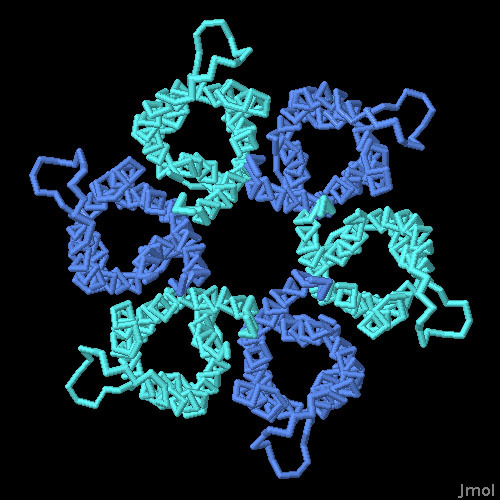 This urease is a huge complex built of twelve copies of two types of subunits, shown here from PDB entry 1e9y . Each of the twelve active sites in the complex uses a pair of nickel ions to assist with the urea-splitting reaction. Infection by Helicobacter pylori is currently difficult to fight, requiring treatment with acid-blocking drugs and antibiotics. Researchers are using the structures of proteins from this bacterium to design new drugs to fight infection. The proton-gated urea channel is one key target, since it is a characteristic feature of the bacterium. To take a closer look at this structure, and explore the structural features that help it sense acid and pass urea, click on the image for an interactive Jmol. 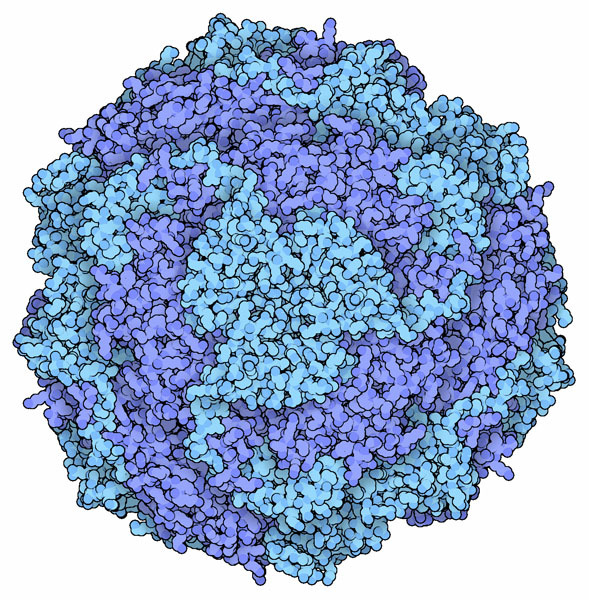 Several other proteins from Helicobacter pylori, including an acid-sensing protein (PDB entry 3ub7), are available for exploration in the PDB archive. Structures for several urea transporters are also available in the PDB, including one similar to the one in our kidneys. D. Strugatsky, R. McNulty, K. Munson, C.-K. Chen, S. M. Soltis, G. Sachs & H. Luecke (2012) Structure of the proton-gated urea channel from the gastric pathogen Helicobacter pylori Nature 493, 255-258. G. Sachs, D. L. Weeks, K. Melchers & D. R. Scott (2003) The gastric biology of Helicobacter pylori. Annual Review of Physiology 65, 349-369. S. Suerbaum & P. Michetti (2002) Helicobacter pylori infection. New England Journal of Medicine 347, 1175-1186. D. L. Weeks & G. Sachs (2001) Sites of pH regulation of the urea channel of Helicobacter pylori. Molecular Microbiology 40, 1249-1259.